I honestly can’t remember how I learned fractions, but I’m sure it was far from fun and engaging. Kids these days are very fortunate to have access to great learning tools: educational apps such as Slice Fractions. Slice Fractions is a new app from Ululab which introduces the concepts of fractions through 60 levels of puzzles. The puzzles are designed as a problem solving activity to help a young mammoth find a path to his beloved. On his journey, the young mammoth will face many obstacles such as fire/ice blocks and large gaps in the road. Kids must apply logic to clear these obstacles: to clear an ice block, for example, they have to hit it with a fire block of the same size, and vice versa. 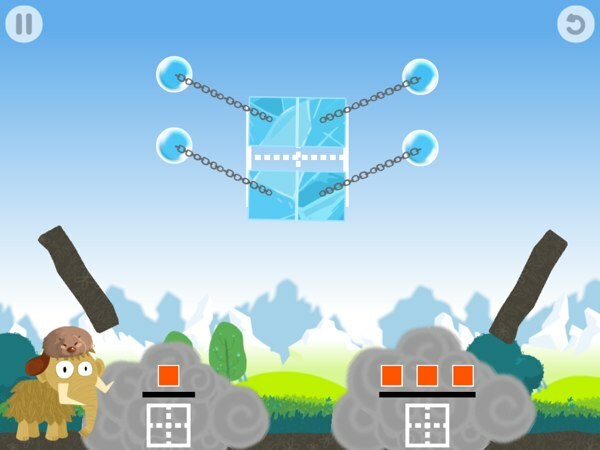 To make things more challenging, the blocks are usually tied to a chain or being held back by a small bubble. The chain itself is anchored to a small bubble. As you progress through the early stages, you will learn to pop these bubbles in a timely and correct order to steer the block’s movement across the terrain, and clear the path for the young mammoth. As the game progresses, more types of moves will be available such as slicing the fire/ice blocks into halves, thirds, or more, to match the required size. Kids will also learn how to add/combine these block fractions to solve more complicated puzzles. For example, at one point kids may stumble upon a smaller block which requires only half of its negating block to clear. If they hit it with a full block, the residual half will become a new issue. Thus, it is important to keep both blocks equal. To ease the learning curve, the game uses a dividing line guide to help juniors determine how they want to slice the blocks. The lines will be removed gradually as the game progresses. Slice Fractions includes 11 lessons, each with an achievement badge to unlock. Each lesson consists of 5–6 levels. At the end of each lesson, kids can review what they have just learned from the puzzles. The puzzles and gameplay mechanics in Slice Fractions have been reviewed by researchers at Université du Québec à Montréal in Canada. They also adhere to Common Core Standards for Grade 2-4 on the fractions topic. If you browse the levels from the main menu, you can tap and hold to show which levels are designed to teach each subtopic. Throughout the 60 levels, juniors will learn how to find shapes of equal sizes, slice shapes to fit the required size, and compare its size to a common whole. They will learn to read fractions as the game starts to add labels to the shapes. Then, they can use that information to compare fractions, find equivalent fractions, and even perform subtractions. Even though the game does not offer tutorials, it is intuitive enough for juniors to figure out on their own. There are visual cues to help them too. Should kids make a mistake (which would leave the puzzle unsolvable), they can always replay that level without receiving any punishment. In real world math, a problem may have several alternate solutions. This also holds true in Slice Fractions. For example, instead of dividing a big square into four smaller squares, you can also slice it once to get a small rectangle that is only a quarter in size of the original square. As the game progresses, there are plenty of levels where you really need to find a creative solution. I won’t spoil the fun for you and your juniors, but the puzzles are really well designed. So much so that, at the end of the 60 levels, you will be yearning for more. Slice Fractions is a brilliant puzzle game that introduces the basics of fractions. Assisting a cute young mammoth, juniors will slice and match fire/ice blocks to solve various puzzles. The game is so fun, they won’t realize they are gradually learning about fractions. It’s a must-have for juniors ages 7+.